"Four familiar surprise guest stars" still to be announced. Studio Saizensen-developed fighting game Blade Strangers will launch physically and digitally for PlayStation 4 and Switch, and digitally for PC via Steam this summer for $39.99, publisher Nicalis announced. 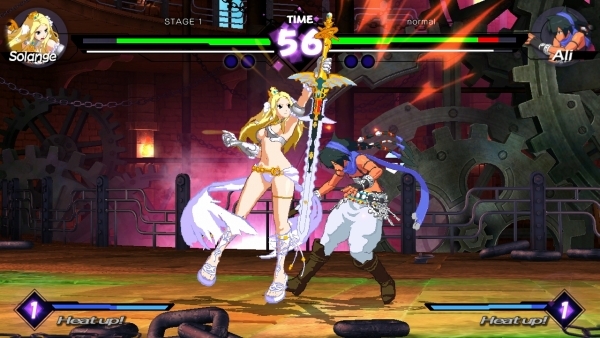 Blade Strangers is an online and offline brawler that features intuitive controls, high-quality visuals and stunning character animations. The game combines the excitement and subtle dynamics of a classic one-on-one fighting game with the polish and features expected from a current-gen contender. Fighter roster includes characters from previous Studio Saizensen games (like Code of Princess EX and Sayonara Umihara Kawase), Nicalis games (like Cave Story+) along with other familiar and surprise entrants. Accessible and intuitive controls designed to bring fresh blood to the ranks of fighting game players everywhere. Play offline Story, Missions, Arcade and Versus modes or try to climb the leaderboards in the competitive Online modes. Each character has three alternate color settings and their own familiar “home” stage for players to select. Proprietary development system transforms 3D models and animation into 2D spritework; every frame looks like a gorgeous anime drawing come to life! Watch the opening movie and a minute-long gameplay montage below. View a new set of screenshots at the gallery.